ELSASS, WALLACE, EVANS & CO., L.P.A. Aaron joined Elsass, Wallace, Evans in November of 2012. He recently relocated to Sidney, Ohio with his wife Kelly. Aaron is a proud father. Aaron loves the theatre and grew up on a horse farm in Virginia. Aaron has successfully argued cases in the Second District Court of Appeals. 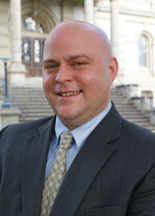 He is currently the Solicitor for the Village of Port Jefferson, Botkins, and Anna, Ohio. Aaron is also a Board Member / Trustee for Samaritan Works, a sober living environment for recovering alcoholics. He enjoys being active in the Sidney Community. Stan has enjoyed a great deal of success in his years as a practicing attorney. He is admitted to practice in the state of Ohio and the United States Federal Courts for the Northern and Southern District of Ohio. In addition, Stan was admitted to practice in the United States Supreme Court. This is a rather uncommon feat and a great honor. We are certainly proud of Stan here at Elsass, Wallace, Evans & Co., L.P.A. for this accomplishment. Congratulations Stan! Elsass, Wallace, Evans & Co., LPA was recently voted as the Best Law Firm in Sidney, Ohio, through the 2018 Reader's Choice Awards of the Sidney Daily News. The firm also received this award in 2017, 2016 and 2014. We would like to congratulate all the 2018 Reader's Choice recipients, thank the community and your support in making Sidney, Ohio, a great place to live and work. Elsass, Wallace, Evans & Co., L.P.A., located in Sidney, Ohio, has a Martindale-Hubbell® Client Review Rating of 5.0 out of 5. Client Review Ratings help provide an objective platform where clients can share their experiences working with a specific lawyer or law firm. 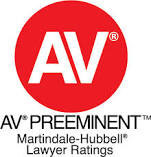 For many years, Martindale-Hubbell® Peer Review Ratings™ have been viewed as an important rating in the legal industry. Attorneys, Richard Wallace and Stan Evans are both rated 5.0 out of 5 for an overall peer rating and meet the highest level of professional excellence and ethical standards. Rich has always taken an active leadership role within the community. He has been involved with volunteer work for over forty years. Rich has received various awards including the 2000 Chamber of Commerce Zenith award for community service, and the 2010 Shelby County Ohio Bar Association Award for Outstanding Community Service. Rich is the author of a historical column entitled, "The Way We Were," published in the local newspaper, The Sidney Daily News. This column focuses on people, places and events of historical significance in Shelby County. Read More. . .
We are pleased to welcome Justin Lopez to the firm. Justin received his Juris Doctorate from The Ohio State University and brings with him experience in a wide array of practice areas. He was admitted to the Ohio State Bar and the United States Federal District Court for the Northern and Southern Districts of Ohio, is active in the community, and is a board member of two non-profit organizations, Miami County Recovery Council and Reading for Change. Read More. . . The materials on this web site have been prepared by Elsass, Wallace, Evans & Co., L.P.A. for informational purposes only. The information provided does not create an attorney-client relationship with our firm or any of its attorneys. You should not act upon this information without seeking professional counsel. You should not send any confidential information to the firm or any of its attorneys or other personnel until you have received written authorization from the firm. The content of any communication you send via the Internet will not be considered confidential unless you have received such written authorization from us. No attorney-client relationship is created by sending such an e-mail. Do not send us any information about your legal problems. Our professional obligations require that before accepting new clients, we must first determine whether or not there are any actual or potential conflicts with any of our existing or former clients. If you wish to inquire into becoming a client of the firm, please telephone our office and request a personal office conference. © Copyright 2019 Law Office of Elsass, Wallace, Evans & Co., L.P.A.